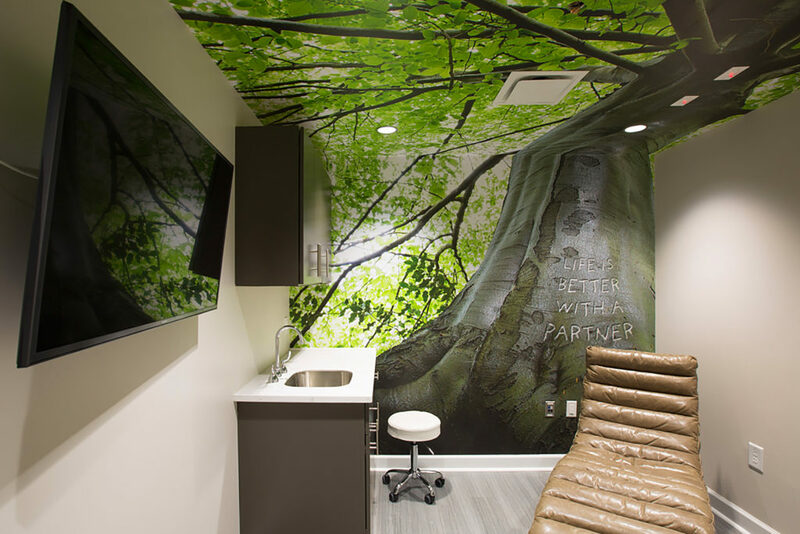 The Lile Wellness custom digital print wallpaper project. No, we can’t produce and install a mural for you while you wait in our lobby, but we learned recently that we can do it pretty fast. 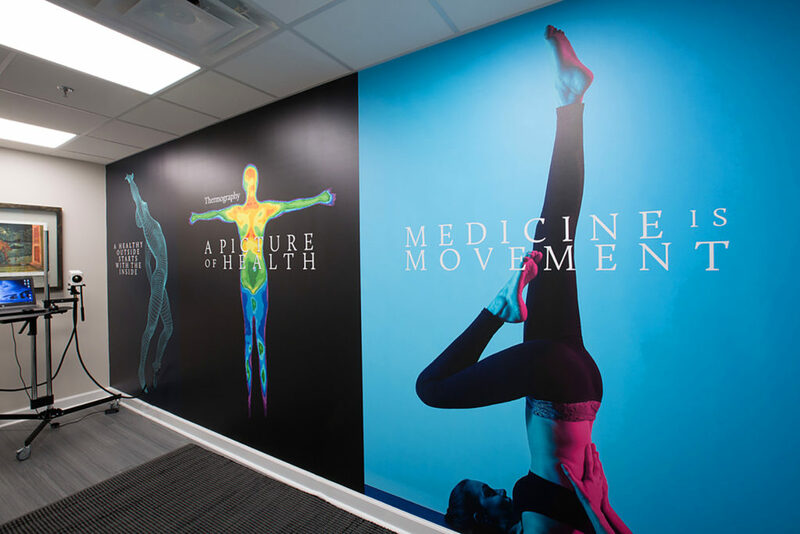 Wallace Graphics was asked by the Whitehouse agency to produce a set of custom digital print wallpaper murals based on their creative concept for the Lile Wellness Partners Alpharetta, Georgia location. Lile Wellness Partners offers a holistic approach to wellness services through compounding, thermography and DNA make up. Its patients are interested in better living through tailored programs to increase stamina, appearance, and longevity. The project presented several challenges. The first being a time frame of 48 hours for the production and installation of the custom digital wallpaper prior to the grand opening of the new location. 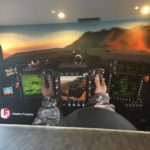 Next, the offices for Lile Wellness were still under construction, and one of the custom wallpaper murals continued on from the wall and onto the ceiling. Our initial step was to measure and prep the walls and ceiling where the murals were to be installed. Working around the contractor’s and builder’s schedule was not a major issue, however, the night crew of painters painted over the prepped walls, which reduced our installation time to 24 hours. The final challenge was the amount of custom cutting required for the ceiling mural due to the number of lights, air vents, and sprinkler heads. We chose Bali Hai Wallscapes by Ultraflex for the wallpaper material, because of its mild texture, low sheen, and durability. 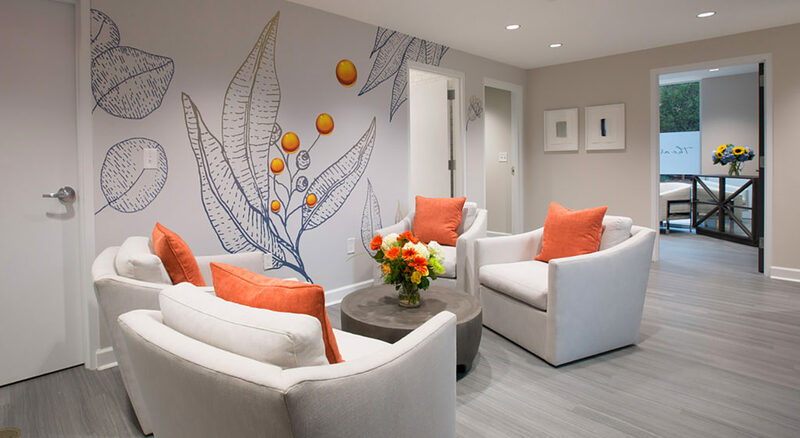 In a commercial setting, a higher grade of wallpaper material is needed for its scuff resistance and easy cleaning without impacting the digital print. Whether you’re in a hurry or not, we can help with your next custom digital print wallpaper project. Let’s talk. 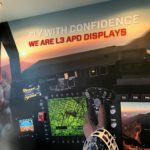 L3 asked Wallace Graphics to assist with updating their lobby. We suggested a large mural for their main lobby wall and dimensional Acrylic logo to add depth to the image selected by the customer. Wallace’s team output the wallpaper, fabricated the dimensional type and installed it all on site in Alpharetta, Georgia. The customer was so happy, that 6 more wall murals were designed and installed in the rest of the facility! Whether you opt for an existing digital wallpaper design or have something created to meet your own specific needs, there are some amazing digital wallpaper trends emerging in 2017. Above all, innovative digital printing technology allows designers to create just about anything they want. 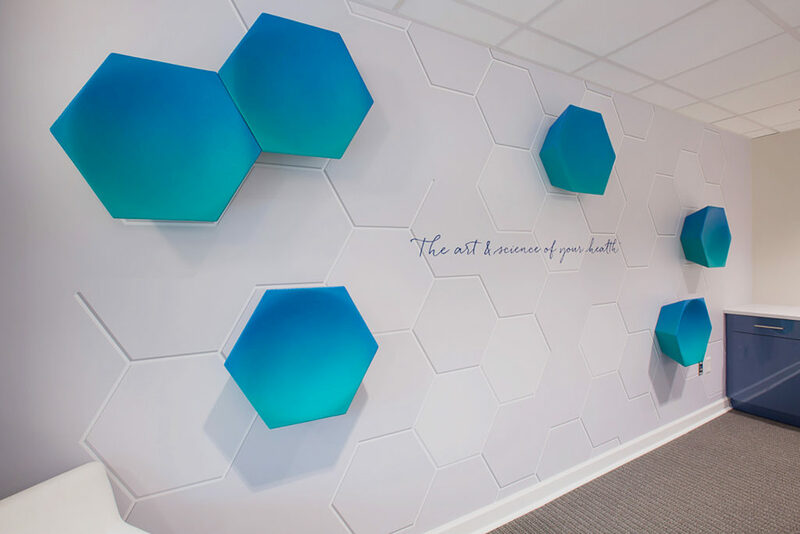 This incorporates an enormous world of needs from incredible feature walls that simply inspire, to walls that make a corporate statement. The over-riding factor is that one-of-a-kind murals may be created using short runs that don’t rely on stock. It’s print-on-demand for wallpaper! So What is Trending in the World of Digital Wallpaper? Interactive wallpaper that isn’t simply a backdrop, but something that means something. For children, bold black-and-white illustrations invite them to color while for adults, magnetic wallpaper gives them the opportunity to hang up their own works of art. Metallic digital wallpaper, while not new in concept, continues to trend. It adds glitz and load of glamor and can look old or new in style. Glow-in-the-dark wallpaper that brings a room alive at night. Digital wallpaper that features florals and botanical images is back in vogue. But not pretty pink like granny used to like! These are bold and beautiful and don’t necessarily look like plants and flowers found in nature. The idea is simply to exploit the images to enhance your interior, either corporate or homey. Botanical realities from ferns to water lilies. Using a beautiful photograph that could be a view from your living room or corporate office. It’s an amazing solution for rooms without windows! The ultimate trompe l’oeil that mimics any number of surfaces from wood paneling to brick or stone surfaces. It’s even easier than using a faux veneer. Feature walls that mimic natural materials from reeds to rusty fencing. Although similar to the trompe l’oeil idea, this type of digital wallpaper can be more of a picture than a fake surface – a mix between the two previous ideas. All-in-all most of these trends lie in a world of infinite virtual reality and can take on any form you like. This is at the heart of digital wallpaper. If you want some great ideas for your spaces, contact MegaBytes Digital today. We can help you make it happen.